Slots tournaments are a great way to win big risking very little but until now they’ve been scarce. 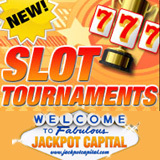 However, US-friendly JackpotCapital.com, already famous for having the best games and biggest progressive jackpots available to American players, is now hosting daily slot machine tournaments. Players can enter for as little as $1.10 and win cash from jackpot pools that can be several hundred dollars or, as they were for the inaugural free roll tournaments last week, up to $1000. Since all that can be lost is the entry fee, slots tournaments are a great way to enjoy playing slots while risking only a few dollars. Almost daily, there’s a tournament being played on the Crystal Waters slot machine with an entry fee of only $6.60. If 100 players register, the prize pool will be $600. That will be split between the top ten players with the winner receiving over $200. There will also be several tournaments this weekend where the buy-in is $11 so the prize pools could be much higher. Tournaments appear on the schedule four hours before they begin and registrations begin two hours before the tournament commences. Players can check the tournament schedule and register to play in upcoming tournaments by clicking on the “Tournaments” button in the casino lobby. The Tournaments window includes a leaderboard where they can check their current standings and a personal tournament schedule listing all tournaments in which a player has registered.